DemoCurmudgeon: Next Year, Buy from Generic competitors to EpiPen. Next Year, Buy from Generic competitors to EpiPen. Thanks for nothing. The company that upped the price on EpiPen's now wants to dominate the "generic" market with the same drug? I could be wrong but maybe just dropping the price would be easier than discount cards, insurance deals and a generic side product. The drug maker's generic EpiPin will sell for $300, half the cost of its branded product. The move comes amid criticism from the public and lawmakers over big price hikes. $300, what a break? It was just $100 back in 2009. Mylan of course wants to negotiate downward, while still raking in the higher prices paid by the poor and uninsured. The price of the EpiPen has soared 500% since generic drug company Mylan bought the treatment nine years ago. Yet Mylan’s controversial CEO Heather Bresch says she and her company aren’t solely to blame. "My frustration is there's a list price of $608," said Bresch, who said that price reflects a system where there are "four or five hands that the product touches and companies that it goes through before it ever gets to that patient at the counter." ... intermediaries including wholesalers, retailers and pharmacy benefit managers add to the ultimate cost, and hence can increase the amount paid by patients. She noted that Mylan has costs that include "manufacturing the product, distributing the product, enhancing the product, investing." You mean like before when prices were lower? Seriously? Bresch also blamed our broken health care system based on private insurance companies and high deductibles. And don't forget, high deductible insurance came right out of the Republican idea factory, as a way to make sure patients have "skin in the game" (like being sick or injured isn't enough skin in the game). She said that the health-care system is in crisis, causing the patient to pay for full retail prices at the drug counter and rising premiums on their health insurance. "The patient is paying twice," Bresch said. "They're paying full retail price at the counter, and they're paying higher premiums on their insurance. 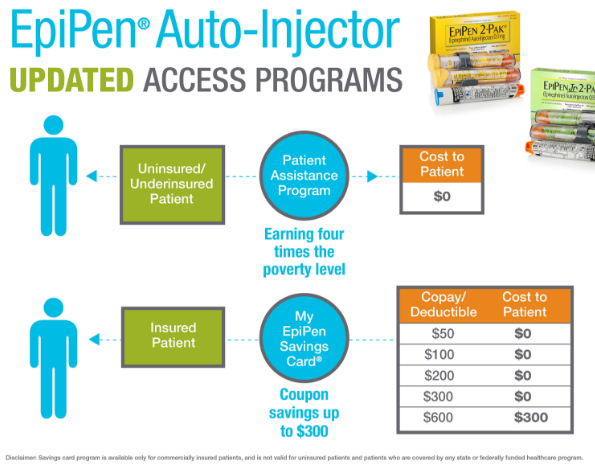 Another reason for EpiPen's price increase? Let the Insurance companies pay, or so says "J. Michael Pearson, the former chief of Valeant Pharmaceuticals International, which has come to be viewed as an industry pariah after profiting for years on drastic price increases on old drugs:"
So before you blame the Affordable Care Act for insurer price hikes and cost shifting to high deductibles, you might want to direct your frustration at the pharmaceutical companies. 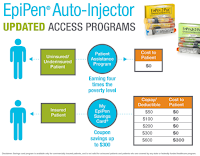 "These changes will help some customers who are struggling to afford EpiPens. Your discount programs, however, represent a well-defined industry tactic to keep costs high through a complex shell game," Warren wrote. One of the cruelties of drug pricing is that the burden falls most heavily on those least able to pay it. Uninsured patients often must pay the list price of a drug, and an increasingly large share of insured customers are being asked to pay a percentage of the list price.